Did you know there is an American Ninja FIVE? Apparently there is, even though it was meant to be something called American Dragons and perhaps they didn’t want to confuse it with the other, better movie of the same name. In this anti-climactic ending to the American Ninja franchise, David Bradley plays Joe Kastle (not Davidson as in prior A.N. films), a guy who lives on a boat and likes to work out. One day, Master Tetsu (Morita) pawns off his “grand-nephew” Hiro (Reyes) on Joe and leaves to go to Greece for a vacation. 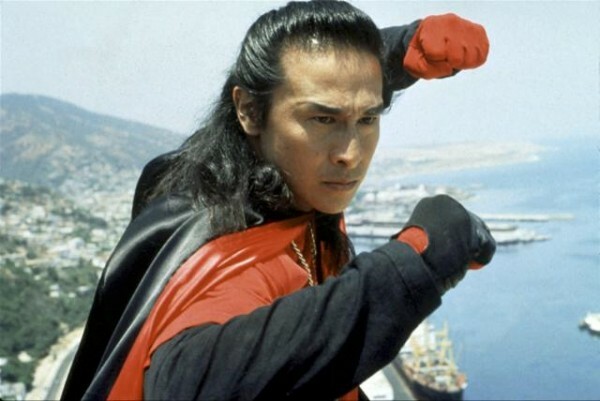 While Joe is learning to cope with babysitting this annoying brat, it turns out that his new girlfriend Lisa (Dupont) is kidnapped by the evil Viper (Lew) and his gang of ninjas. Viper works for the nefarious Glock (von Franckenstein), a man who is using scientists to develop an insecticide named ZB-12. Lisa’s father is a scientist but refuses to work on the potentially dangerous project. So Joe and Hiro must go through a bunch of travails in Venezuela to rescue Lisa who is kidnapped there. Along the way, Joe and Hiro forge a friendship based on the ways of the ninja. Rather than be loyal to the fans that have followed the series through the years, Cannon pawns this juvenile, watered-down, PG-13 rated dreck on the audience like Pat Morita does his bratty relative onto David Bradley in this patience-testing exercise. Bradley is likable enough and he looks like a young Craig Ferguson, although he is your classic action movie dum-dum. His young foil is another matter. Hiro is a precocious 12 year old whose presence in this movie is not needed. He says “whoa!” while Bradley fights the baddies, who are purple, green, and white ninjas, as if this was a video game. Speaking of which, Hiro’s Game Gear plays a surprisingly big role in this film. Hiro has a matching Miami Dolphins baseball cap/coat and, sadly, brings this movie into the current “ADD generation”. The movie as a whole could have been better, even if it was aiming more for the family market, but this Hiro kid gets on your nerves. Plus the whole daughter/scientist father aspect was already done in American Ninja 2 (1987). Couldn’t they come up with something new? It’s director Leonard’s only movie to date and you think he would be familiar with past entries in the series, but maybe he never watched them. That’s certainly what it seems like; he didn’t try to impress with his knowledge of past A.N.‘s, that’s for sure...which seems odd. 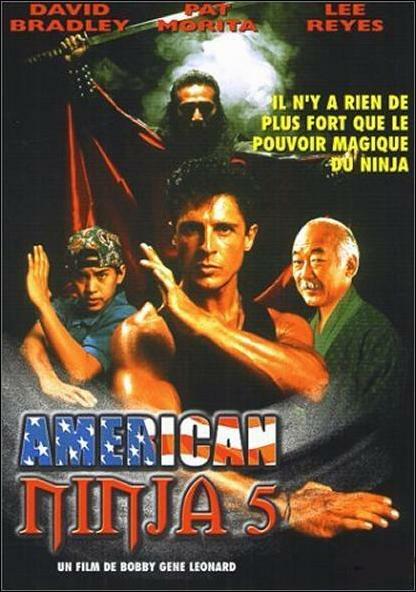 Having American Ninja 5 be the only movie on your resume is indeed a bizarre way to enter movie history. The whole Karate Kid aspect of the film is even further enhanced by the presence of Pat Morita. Did any kid ever see this movie...ever? The baddies are more interesting, as Glock strongly resembles Bernie Madoff and James Lew’s entrances and exits are by far the best part of this movie. It’s here that this film becomes utterly absurd. They should have gone in that direction more, if you see the movie you’ll know what we mean. The jaunty flute music enhances the mild nature of the proceedings, and it’s unfortunate that the mighty American Ninja franchise fell victim to the old sitcom trick of “Addakid”, that is, when all the sitcom kids grow up and aren’t cute anymore, to simply add a newer, younger, cuter kid regardless of whether it makes sense plotwise. It’s an ignominious way for this beloved series to go. Even though this movie came out in 1993, it looks and seems older, but maybe that’s because it’s pretty lame and impotent, not to mention way overlong. 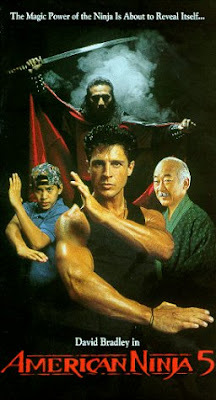 You’d have to be a die-hard fan of the American Ninja films or any of the actors involved to sit through this insult to people who followed the original four films in this series. Good review, glad I skipped this one. Sounds like it makes the third one look good. Seems like i'm the only person who dosen't usually get annoyed by kids in action films, I thought the Hiro kid was pretty likeable actually, this may be the worst film in the AN series but it still wasn't bad by any means, I just think it should've had a different title. Ed: Thanks! We will have an American Ninja 3 review coming in 2012. Venom: We agree it should have had a different title. We are not against kids in action movies but we felt this kid in particular was pretty obnoxious. Had no idea this one existed. Thanks for the review, really good and insightful. Makes me think if there's any kids in action movies I'd like to beat with a stick. Strange that this movie is rated 18 in the UK? John: No problem, this is one to be avoided unless you want to complete the series. Good question, one example is the horrible sidekick in the Eric Roberts flick Hitman's Run. Lee: That is really weird! This is basically a kids movie. Have I lost it or did I read sommewhere that original American Ninja Michael Didikoff was gonnabe in Expendables 2? That would be awesome! Hopefully that rumor is true. I recently checked Dudikoff's IMDB page and he dosen't have any recent films listed, so I think that rumor is false. P.S. I totally forgot about the sidekick in Hitman's Run til you guys brought it up. Hellford667: If the annoying kid wasn't in this, this could have been decent. That's good that the kid in Real Steel wasn't irritating! Venom: We would like to forget the sidekick in Hitman's Run too! Haha. See, I took this one totally different, I took it as a spoof on the other movies, which was kind of a fun way to wrap up the series. I'm hoping it was a spoof, because otherwise, you're right, it's pretty rough. When will they stop casting annoying kids in action films? They never learn. We go in to see action films with action and violence. Not to hear bratty pre-teen kids whine for 2 hours. Sheesh! Yeah, this should have had another title, it's pretty unconnected to the other films apart from having David Bradley. Hiro: You killed my father! Viper: I kill many fathers. DTVC: Interesting take on it. I only wished we watched like that. As a ninja flick, it is a total dud. As a comedy, it is a little better...especially that REALLY EVIL General that is in the movie for 2 seconds. RobotGEEK: I know! They ruin the action and fun experience. If there is an annoying kid in Expendables 2...that would be tragic! Jack Thursby: Haha, that was a great line delivered by Lew. He almost saved the movie.